We are a non-profit 501(c)(3) organization, made up of Point Breeze North residents and landowners. We value the diversity of people in our neighborhood, we value the heritage, land and architecture. Our goal is to help protect those things for our families and future generations of Point Breeze North residents. Our neighborhood is significant for its history and architecture. Many leading 19th and 20th century industrialists called Point Breeze home, including H.J. Heinz and George Westinghouse. Today, the wonderful assortment of vintage homes, duplexes and apartments make up the backbone of this neighborhood. On the periphery are a number of businesses, both small and large. Jeff grew up in North Hills suburbs but bought his first house and fixer-upper in Point Breeze North in 1999. He was drawn to the neighborhood by the charm and diversity of the neighborhood houses as well as the residents that live here. Jeff’s background and education is in Architecture, Environmental Design and Urban Planning. Throughout his career as an Architect he has studied throughout Europe and spent 5 years in Dubai building an architecture practice. Jeff returned to Point Breeze in 2010 and has been active in the PBNDC since then and has been on the Board of Directors for the past 7 years. 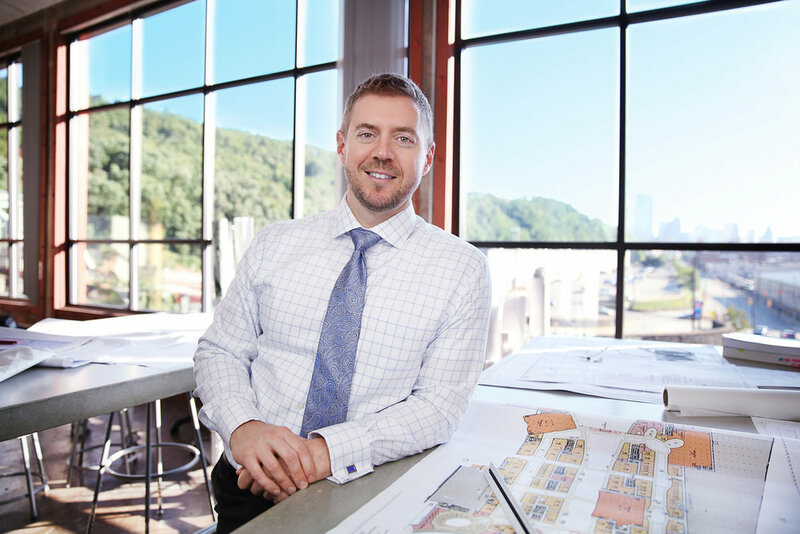 Jeff now has a practice in the Strip District of Pittsburgh which specializes in Architecture, Interior Design, Landscape Design and Master Planning. Jeff can often be found walking his two dogs throughout the neighborhood and working on his house which was built in 1905. Blyden moved to Point Breeze, now called Point Breeze North, in 1972 had has been involved in block organizations in the community since the 80's. He has a degree in chemistry and mathematics and attended the University of Pittsburgh School of Medicine. Blyden is the Founder and CEO of BOVIET Research and Development LLC, which develops innovative technology for touch screen devices as well as adhesives for Ostomy devices. He is also the Community Liaison Affair Officer for 2414 Morgan LLC, a commercial development entity, as well as President and CEO of Terry and Associates, a real estate and economic development firm. In the past, he was also VP for Peoples Beauty Supply, where he focused on providing employment opportunities and enhancing economic vitality to the East liberty and Homewood communities. Blyden was also the VP of East Liberty Development Corporation from 1998 until 2001, where he participated in Penn Plaza, Mellon Street and the Community Builders Housing Projects, and helped attract Home Depot, Whole Food Market, Walgreens and other entities to the East Liberty Market. Seth is a six year resident of North Point Breeze where he lives with his wife, two boys, and dog. He is committed to maintaining the unique diversity of the neighborhood - one in which people from different races, ages, backgrounds, socio-economic status, and more live together. Seth enjoys spending time with his family and good friends; talking public policy and politics; singing, listening to, and seeing music; watching and playing international football; and exploring the urban fabric of cities. As founding partner of The People Group - a consultancy focused on leadership development - he brings to bear his varied life experiences to create individual, organizational, and systems change. By building people’s capacity to strategically address issues, he facilitates the creation of better-functioning relationships, workplaces, and communities. George Moses moved to Thomas Blvd in 2005. Throughout his career, he has been involved with housing for all people. George has worked for the Housing Alliance of Pennsylvania and was also a board member for this organization. For his efforts, he was elected to the Board of Directors in 2001 and served as the Chair of the Board from 2006 - 2013. George now works at East Liberty Family Health Care Center where he is the Outreach Associate. He is married to Rev Nicita Moses. Kelly has lived in Pittsburgh since 2012 and has been a renter in North Point Breeze since 2016. She chairs the PBNDC Communications Committee and is revitalizing the Social Development Committee. Professionally, Kelly works at the intersection between sustainability and education and centers the elimination of racial oppression in that work. She is the Eden Hall Campus K-12 Education Manager and Adjunct Faculty for Chatham University. Kelly is also a LEED Accredited Professional for green building certification, helped start the Pittsburgh 2030 District while working for the Green Building Alliance, has worked in communications for the energy efficiency industry and has done basic science research for solar photovoltaics materials. She loves to dance and to spend time outside: backpacking, caving, ice climbing, and making friends while playing bagpipes in Westinghouse Park. Brian grew up in the Pittsburgh area and has been a homeowner in North Point Breeze since 2008. He is an Electrical Engineer and works as a manager at a local engineering company. Brian has experience managing large technical projects and brings this experience to the board. He is interested in growing the organization, with a goal to develop a long term sustainable organization that supports the community. Brian is also interested in showcasing our neighborhood as a great place to live and has established the PBNDC Beautification Committee. Through this committee Brian hopes to plan and accomplish multiple projects focused on improving the neighborhood. A copy of PBNDC’s bylaws are available here.